UPDATE: Links added for more news about West Virginia businessman Jim Justice. National Coal Corp. has decided selling out is its best option. The Knoxville-based coal company on Tuesday said it is being sold to Ranger Energy Investments LLC for $1 per share of common stock. The proposed sale price represents a 54 percent premium on National Coal’s closing price of 65 cents per share on Monday. This entry was posted in National Coal and tagged Daniel Roling, Jim Justice, National Coal Corp., Ranger Energy Investments on September 28, 2010 by Roger Harris. Is merger the answer for National Coal? Knoxville-based coal producer National Coal Corp. is taking a look at possible merger with other coal companies to help it bounce back from a tough year. National Coal announced Tuesday it has hired a financial advisor to examine merger and other financial alternatives. The company has battled hard in recent months to restore balance to its balance sheet. It has sold millions of dollars worth of assets and is fighting to avoid delisting by Nasdaq. Merger is only one strategic option. It will be interesting to see what the advisor recommends. This entry was posted in National Coal and tagged assets, delisting, financial report, merger, Nasdaq, National Coal, profit on August 10, 2010 by Roger Harris. 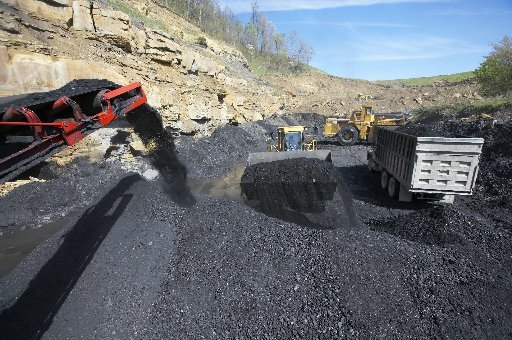 Knoxville-based National Coal Corp. recently generated some much-needed cash by selling a Superior Highwall Mining System for $4.1 million, according to a Securities Exchange Commission filing. The system was sold to SEACAP Leasing Associates II LLC. National Coal has been in a selling mood lately as it has moved aggressively to pay off debt. Among assets previously sold were the New River Tract near Oneida, Tenn., a preparation plant and a short-line railroad. Click here for National Coal SEC filings on Edgar online. This entry was posted in National Coal and tagged National Coal Corp., Securities and Exchange Commission on July 9, 2010 by Roger Harris. National Coal Corp. has started construction of a new mine which will add 480,000 tons per year to the company’s production, generating some much needed cash. “With the beginning of construction on Mine 12, the Company reaffirms its focus on lower costs, higher selling prices, and improved margins. This mine should help us achieve one of our key goals — generating free cash flow,” Daniel A. Roling, president and CEO of the Knoxville-based company said in a statement released Thursday. f debt and last month executed a 1-for-4 reverse stock split. This entry was posted in National Coal and tagged Daniel Roling, mine, National Coal Corp. on July 2, 2010 by Roger Harris. Will reverse stock split save National Coal? The not-so-good times continue for National Coal Corp. The Knoxville-based coal producer on Tuesday said its board had approved a 1-for-4 stock split. Trading of the split stocks began today. Reverse stock splits reduce the number of shares outstanding. This increases the value of individual shares but does not change the market value of the company’s total shares outstanding. It’s all about appearances, or making the stock look more valuable than it really is. But will it be enough to bring National Coal a reversal of fortune? This entry was posted in National Coal and tagged default, National Coal Corp., reverse stock split, short-line on June 22, 2010 by Roger Harris.